Home theater enthusiasts get fussy about subwoofers. They sweat over a couple of Hz difference in frequency response, a couple of dB difference in maximum output, whether or not the sub is down-firing or front-firing, etc. Much of this has little real-world impact, especially considering that moving your listening chair two feet in any direction is likely to change the sound more. Sometimes, though, the little things do make a difference, as Outlaw Audio's new Ultra-X12 reminded me once again. The $639 Ultra-X12 is the first new Outlaw subwoofer in more than half a decade. As company president Peter Tribeman told me, "Our existing subs are really good, but we've had them in our line for six or seven years. Technology has changed, and we wanted to create something new. We wanted to build a sub that was roughly the size of our LFM-1 Plus, which was popular because it's not too big, but we wanted to more or less match the performance of the big LFM-1 EX." Technically, the biggest difference between the old designs and the Ultra-X12 is in the amplifier. The old amp was a 350-watt BASH amplifier. The new one is a 350-watt Class HD amplifier from Audera, a company founded by engineers who worked on the BASH amp. Both are high-efficiency topologies, designed to consume less power at idle than a traditional Class AB amplifier does. I've seen varying descriptions of the BASH technology, but it appears to have been a Class G or H device, with a power supply that tracks the incoming audio signal and adjusts its output to reduce the power delivered to the amp whenever possible. Audera's Class HD is a combination of Classes H and D -- the power supply tracks the incoming signal as in a Class H amp, but the amplifier itself is a high-efficiency Class D (also referred to as a switching or digital amp) design. I can't say if one is better than the other; my assumption is Class HD is more efficient than BASH but would emit more radio-frequency (RF) energy. According to Tribeman, the most audible difference is due to a new design for the internal bracing that stiffens the enclosure. He told me that, when the company's engineers re-evaluated the original designs, they found a slight bump in the response around 60 to 65 Hz, which resulted in a sound they considered a little too fat. They traced the problem to inadequate internal bracing, which was allowing the side panels to resonate around those frequencies. The original Outlaw LFM-1 models had internal braces running in only one direction. The new Ultra-X12 has braces in a "window pane" pattern, running in both directions, a change Tribeman says flattened the mid-bass response considerably. The basic design of the 66-pound Ultra-X12 is simple, straightforward, and muscular. The driver is a beefy, down-firing 12-incher. The ports are also down-firing. Two sound modes are offered: Max Extension and Max Output. The former lets the Ultra-X12 play a little deeper, while the latter lets it play a little louder. I used the Ultra-X12 with two preamp/processors: an Outlaw Model 975 and a Denon AVR-2809Ci receiver connected for line-level output. Both fed an AudioControl Savoy multichannel amp. I tried it with three of my tiny but mighty Sunfire CRM-2 speakers in front, with two CRM-2BIP surround speakers. I also used a pair of MartinLogan Motion 60XT tower speakers (review coming soon). With the former, the crossover point was set to 100 Hz; with the latter, to 80 Hz. The pre/pros fed the Ultra-X12 through a line-level connection to its LFE input. There's also an LFE output that allows daisy-chaining a second subwoofer. Stereo RCA line-level inputs are included, as are speaker-level inputs and outputs, so it should be reasonably easy to interface the Ultra-X12 with almost any kind of system. The internal crossover is adjustable from 60 to 120 Hz, and there's a zero-/180-degree phase switch. 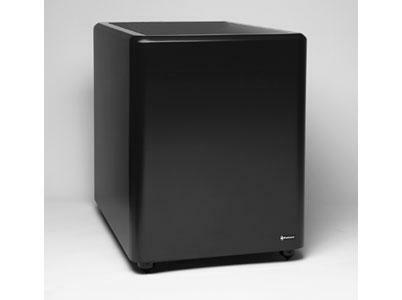 I'll start by stating that the Ultra-X12 should definitely be considered a high-performance subwoofer. Live Die Repeat: Edge of Tomorrow, the latest Tom Cruise post-apocalyptic action pic, opens with fragmentary snippets of sound, then introduces very loud bass tones starting at 100 Hz and reaching down to 29, 24, and 19 Hz. It's sort of like a reverse dog whistle, something than will be heard only by home theater enthusiasts who have really good subwoofers; people who use soundbars will likely never hear those lowest tones. Not expecting such intense tones to appear in the first few seconds of the movie, I thought the subwoofer or something else in the system was malfunctioning. I played the VUDU HD stream of the movie again to make sure. (And again and again and again.) Yep, those tones were in the soundtrack, and the Ultra-X12 reproduced them cleanly and very loudly. The Ultra-X12 was similarly unfazed by the deep sounds of submarine engines in the scene from U-571 where the sub dives under a German destroyer. It's here where I got the inspiration for my first paragraph, where I talked about little things in a subwoofer sometimes making a big difference. I didn't think I'd develop much preference for either the Max Extension or Max Output modes, but for movie soundtracks, the Max Output mode did a substantially better job. The depth charge explosions in U-571 had much more impact in Max Output mode. In Max Extension mode, the sub's punch decreased, its distortion increased a little, and the improvement in ultra-low-bass response seemed negligible. Thus, I left the Ultra-X12 in Max Output mode for almost all of my Blu-ray viewing and Internet video streaming through VUDU and Amazon. For most of my listening, I kept the subwoofer properly balanced with the main speakers, but I also listened to Star Trek Into Darkness with the subwoofer's level raised +3 dB to see if I could push it past its limits. I was never able to push it into gross distortion, but in Max Extension mode, the notes started to lose their definition at extreme levels. In Max Output mode, the output seems adequate for anything but the biggest home theaters (say 4,000 cubic feet and larger). However, for music listening, I preferred the Max Extension mode, which seemed to have a flatter response that blended better with the MartinLogan Motion 60XT tower speakers. For example, the bass line on Steely Dan's "Aja" sang along more smoothly in Max Extension mode, with a melodic groove that never called attention to itself with excessive punch or resonance. The notes in the bass line also seemed to stop faster instead of ringing subtly as they did in Max Output mode. Of course, your preference for these modes will vary with your room acoustics, whether or not you're using room correction such as Audyssey or Dirac Live, your listening material, and your personal taste. I'd suggest experimenting to see what you like; but, if doing audio comparisons isn't to your liking, just use Max Output if you listen mainly to movies and Max Extension if you listen mainly to music.